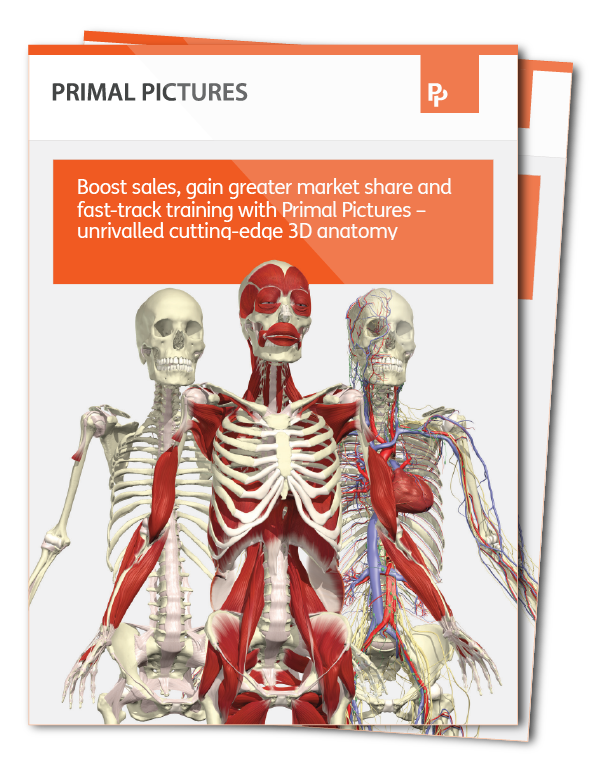 Primal Pictures delivers unrivalled 3D Anatomy solutions for the healthcare and life sciences market, with highly effective employee training and development programs that differentiate your people, products and services. Captivating solutions for sales team and staff training, R&D and product management, physician education and engagement and more— all designed to facilitate faster learning, clear comprehension and superior retention. Brings sales and marketing teams up to speed quickly - Develop clear understanding of core anatomy and physiology topics and reinforce the use of anatomical language to ensure your team are seen as experts. Maximize on-boarding effectiveness - Equip new sales reps to sell more, sooner with proven educational solutions. Skills enhancement - Facilitate ongoing professional development and enable staff to perform better at their jobs by providing accessible, intuitive and interactive tools for anatomical reference and ongoing learning. 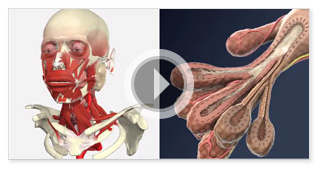 Educate and train medical professionals in the uses and applications of your product portfolio by using the highest quality anatomy images, animations, video and detailed descriptions available anywhere. 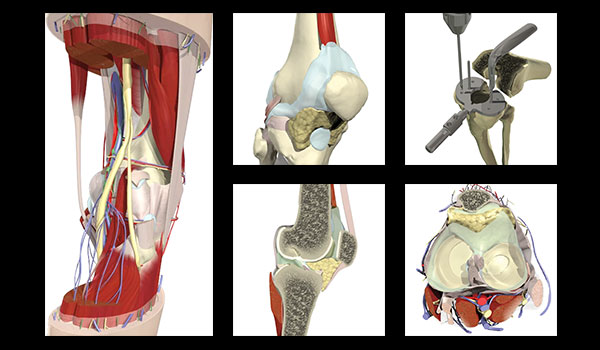 For more than 25 years, Primal Pictures has pioneered and led the way in providing the world’s most cutting-edge, medically accurate and detailed 3D digital anatomy solutions. Our engaging and unique content can be tailored to your specific market, product and business needs. Learn how Primal Pictures can help you uniquely differentiate your business today. 1) Once launched, sign in to your Pharma Intelligence account using your existing user name and password. 3) Refer to the instructional materials on this page for further details. Contact Orchestrall today to learn more about how OrchestrallConnect and Primal Pictures can enhance your corporate learning and development needs. What is the Administrator Portal? The Administrator Portal is a new tool that allows an account�s administrator to manage how their end users access Scrip, Pink Sheet, In Vivo, Medtech Insight, and Rose Sheet. An administrator is anyone who oversees which end users are allowed access to products or otherwise manages their usage of the products. You decide whether you want the Administrator Portal, although we recommend it for accounts with a large number of users, as it makes common tasks such as adding users, verifying access, or resetting passwords quick and easy. What can you do in the Administrator Portal? 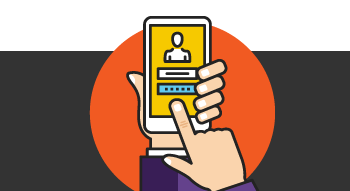 The administrator can add new users (individually or in bulk), add or remove users from a service, reset user passwords, make users inactive, and view the number of available seats. Currently, billing, renewals, and address changes cannot be handled through the Administrator Portal. Can more than one person in a company be an Administrator? More than one person can be designated as an administrator, although we suggest that each person have a defined role. For example, you may have a primary administrator and a back-up, or administrators who work with particular departments. If I subscribe to more than one product, are they managed in the same portal? Yes, if you subscribe to multiple publications, you will manage the products and users within the same portal. For example, you can entitle a single user to multiple products, or give a user access to one product, but not another. At the moment, only Scrip, Pink Sheet, Medtech Insight, and Rose Sheet can be managed in the portal, but as more products move onto a common access management system, these products will also be available in the same portal. How does an administrator access the portal? If you are an administrator, you will receive a separate URL to directly access the portal. You will also need to reset your password, so that you can access both the portal and the product sites using a common username and password. How do I request that I be made an administrator? Can an administrator designate someone else as an administrator? Please contact your account manager or client services to request your administrator access. Once you receive your access information and reset your password, you will be able to access the portal immediately. An administrator cannot make other users administrators (or take away administrator access) within the portal, but client services can do this for you. Is the portal included in my subscription? Yes, if you wish to use the Administrator Portal, it is included as a part of your subscription without charge. What training resources are available to administrators? Once you are designated as an administrator, you will receive a training guide that walks you through how to perform tasks in the portal. You may also request a live session with our client services team. Pharma Intelligence. Copyright 2017 Informa Plc.